What does that have to do with Virginia Beach? We've already rezoned the Strategic Growth Areas (SGAs), and many have low-end uses of their land presently. Constructing light rail would make those uses economically obsolete, redeveloping the land without a Redevelopment Authority. There's nothing like a Kerry Dougherty column to ruin your morning. This morning she crapped a big turd, with a column that could have been ghost written by Robert Dean. She attacked Virginia Beach's Strategic Growth Area (SGA) policy, and extolled suburbia. Yes, Kerry, it's a real term. Most land planners now realize how post-World War II excesses have warped society today. One is unsustainable land use patterns, which force you to get in a car and drive 2-3 miles to do anything. "Pollution"?!? Pollution is the very thing Kerry embraces: all those Single Occupancy Vehicles (SOVs) driving forever in suburbia! "Inconvenience"? That's having to drive 4-5 miles to a shopping center to get anything. 4. "Until you've actually schlepped your groceries home on a city bus...."
I've been doing it for 6 years now, Kerry. There's a science to it, but its easily manageable and can be fun in itself. 5. "It beats riding buses - or trains - any day." You know how much I get done on the bus because I'm not preoccupied driving? I read, write, make safe cell phone calls and send texts, etc. Last week I e-mailed in a commendation for a Hampton Roads Transit (HRT) bus Operator from my smartphone while still on her bus. Most of the meeting write-ups on this blog had outlines written on the bus home from the meeting. I take notes in the meeting, write an outline from those notes on the bus home, then post at a desktop. 6. "Here's another: Why should the city continue to be bent on growth?" Also, it's not a question if developers build, but where? Last year we saw a developer attempt to encroach into the suburbia Dougherty pretends to champion, proposing to convert residential to office in Acredale. If the SGAs fail to bloom, it's at least as easy for them to do that as anything else. Let's call opposition to light rail for what it is: the VBTA/Dougherty "May 1,000 Acredales Arise!" Policy. They would destroy the very suburbia they claim to love. 7. "Seems there are nascent plans afoot that would redevelop chunks of the city on a distinctly metropolitan model." Of course, the plans entered the Comprehensive Plan and Zoning Code in 2003. 7 years ago. We can't legally downzone, which Kerry has to know, being a judge's wife. She's playing a disingenuous game, trying to incite people to try to stop what she knows they legally can't. With light rail and redevelopment of the SGAs, the vast majority of Virginia Beach will still look the same in 40-50 years. In fact, it's redeveloping the SGAs (with the transit prerequisite) that will preserve the very neighborhoods that Kerry Dougherty pretends to champion. With "champions" like Dougherty and the VBTA, suburbia doesn't need any enemies! 1. TOD Conspiracy (65%) - Reid believes Transit-Oriented Development (TOD) is part of a massive Marxist conspiracy to change voting patterns, and have the government take control of our transportation and housing. Greenmun claims Karl Marx was the father of modern urban planning, thus inferring "urban = Marxist." 2. La MEChA Conspiracy (20%) - Reid believes Hispanic immigration is part of a conspiracy by radicals to break the Southwest off the United States as a new Latin American nation. 3. Regionalist Conspiracy (15%) - Reid claims Hampton Roads is actually at least three different regions, and that Virginia Beach and Chesapeake should break off to form their own seperate Metropolitan Statistical Area (MSA). (He'd prefer Virginia Beach alone, but we don't have the population for a MSA.) Of course, the irony is lost on him that he's doing the very thing he attacks Regionalists for: cobbling together an artificial MSA. The funny thing is that means the VBTA's allies across the city line would also need to gain control of the Chesapeake City Council. 4. Oceanfront Conspiracy (0%) - Reid has stated that the Resort Area is the center of corruption in Virginia Beach politics, and he admits he's opposed every Resort capital project except the seawall. At the heart of Messnerism-Greenmunism is a blind rage at the Oceanfront. Will the VBTA wake up and dump that raging lunatic from their Board of Directors after the election?!? 1. How do Dave Redmond and Rita Sweet Bellitto avoid sounding like tweedledee and tweedledumb? If I was on one of their campaign staffs, I'd be pressing to roll out a bold signature initiative that would define my candidate in the public's eyes. 2. Given the VBTA circle f*#!, will any of their candidates (John Moss, Bill DeSteph, and Wally Erb) break out of single digits? 3. How high is James Cabiness' name recognition? 5 of the other 6 candidates have been on the ballot before, while Dave Redmond (the other novice) should raise enough cash to get his name out. Will Cabiness finish ahead of any of the VBTAers? The lengthy discussion was on how HRT finances it's operations. Federal aid normally doesn't reach HRT until the 11th month (August) of the Federal fiscal year. That forces HRT to take out a calendar year Line of Credit to borrow against the Federal funds until they arrive. Currently the Line of Credit is $20 million, but Light Rail will require about an additional $7 million. Also, the Federal government has a program under which agencies (like HRT) can apply to receive 5/12ths of their money early, but that HRT has never used before. Like with the Line of Credit, there is a cost involved in the 5/12ths program. Currently the cities are billed quarterly for HRT services, and one Commissioner suggested they pay 100% up front so that cash would be available until Federal funds arrive. However, given the financial state of our cities, they're unlikely to agree to such a change. Commission recognitions were given to 4 Commissioners who recently departed: James Holley of Portsmouth, Randy Wright of Norfolk, plus Grace Routten and Paige Washington of Hampton. Wright and Routten were on hand to receive their plaques. Also, a video was shown, Randy Wright: The Mobilizer. Wright was chuckling at a few of the older photos of himself in it. Routten will now become an alternate Commissioner for Hampton. The two new Commissioners are George Wallace and Will Moffett. Ridership was down 0.92% in July compared to July, 2009. However, July, 2010 had one fewer weekday than July, 2009. Given that HRT carries 50k passengers on an average weekday, that in itself could explain the 13k drop. HRT finished July $905,699 ahead of Budget, but interim CFO David Sullivan warned against getting too excited over the first month in the fiscal year. Norfolk light rail is 91% complete, with HRT in discussions with the contractor who is to electrify the track through downtown. A contract with TMD for the efficiencies study was approved. The study will look at Resource Effectiveness and Resource Use Efficiency with service, scheduling, and Operators. It is hoped to have a minimal impact on current riders. The target figure is $3 million in efficiencies, the same amount a fare increase to $2 would have brought in. In turn, should that much in efficiencies be found, a fare increase can then be pursued primarily as a means to improve our region's sorely inadequate bus service. Commissioner Charles Whitehurst of Portsmouth called for the TDCHR to hold a Retreat, and Chairman Paul Riddick of Norfolk was asked to schedule one "in a couple of months". The TDCHR's last Retreat was in November, 2008 at the Marriott in downtown Norfolk. The Chesapeake Chapter of the NAACP will hold their 45th annual Freedom Fund Luncheon on Saturday, September 25. It will be held at Noon at the Chesapeake Conference Center. Vendor and Exhibitor opportunities are available. Anyone Still Have A Copy? Over on Virginia News Source, the 2008 City Council Campaign Manifesto for Virginia Beach Taxpayers Alliance (VBTA) candidates, written by Ben Krause, has become a topic of discussion again. 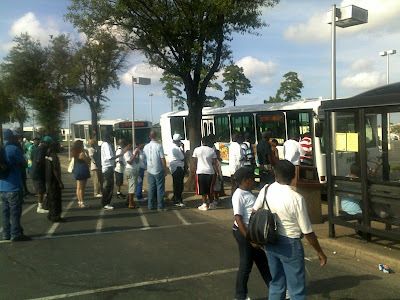 While Ben is feigning support for better bus service as an alternative to light rail, a couple commenters have pointed out that Ben had called for an elimination of Hampton Roads Transit (HRT) service in Virginia Beach. I never saw it myself. One person who read it no longer had a copy to forward me. Therefore, if anyone still has a copy, forward it to vbtasucks@yahoo.com and I'll publish it on this blog. While no VBTA candidate ever officially embraced the Manifesto, no candidate ever repudiated it, either. No One Rides The Bus? Yes, they do - even here in Virginia Beach. This was on the Inbound Route 20 this afternoon, just after we left the stop beside Haynes Furniture (about 3:45 P.M.). 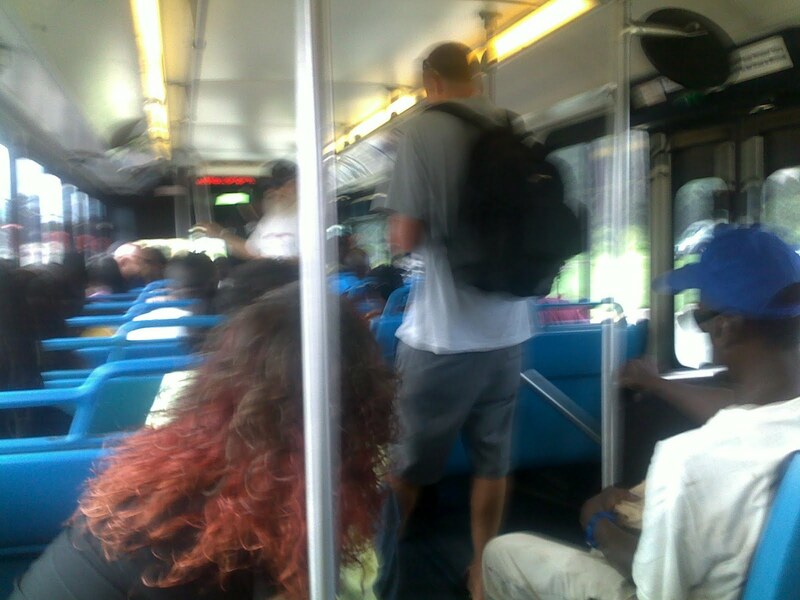 The bus was SRO, with me stuffed back in the rear left corner. A couple things here of note. First, the afternoon rush hour Cutback buses on Routes 15 and 20 start at 3 P.M. in Norfolk, but there are no Cutback 20s in Virginia Beach until 4 P.M. (That's on my Third Shelf if Virginia Beach had more bus service hours to work with.) Second, were Virginia Beach light rail in place, I could have taken the train around this. It would have been the train to the Military Highway Station, then the Route 23 bus to Walmart. Sorry for the picture being a bit blurry, but it looked better on my smartphone. With the November election around the corner, the campaign signage is starting to hit the streets. 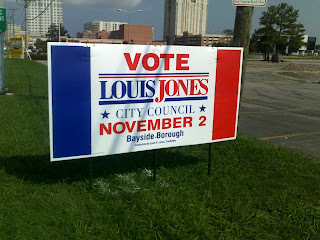 This sign of Louis Jones' is in the periphery of Town Center. First, "Bayside Borough"? Uh...the term "borough" was retired when we went to the 7 balanced districts. In 1995. Second, the color scheme is from the French flag. Better be glad relations with Paris are better than in fairly recent memory. Third, I would have put the campaign website address on the sign. The problem is a Google search doesn't turn up a campaign website for the Vice Mayor. 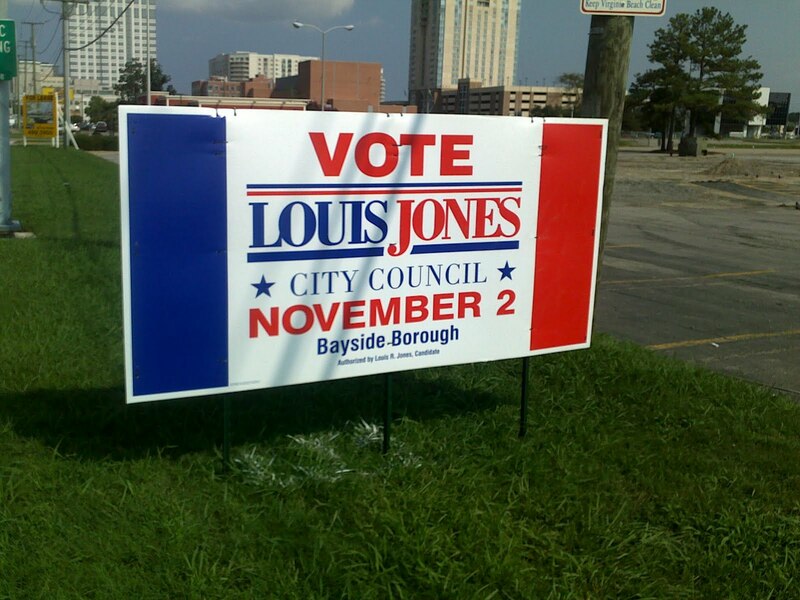 Sorry, Louis, but that's the worst sign since those pale orange things Jerry Kilgore's Attorney General Campaign used in 2001. 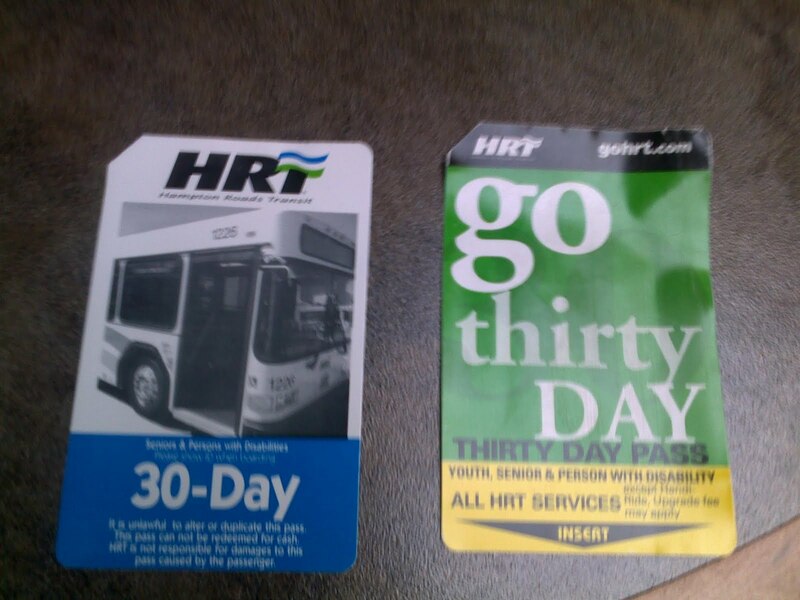 In the above photo, the farecard on the left is the older 30 Day Senior & Disabled farecard. The farecard on the right is the newer one that replaced it. You lost 23-3 last night to my Ravens. Okay, it was preseason, but you guys can't start to defend a fake punt? ROFL! This evening was the annual meeting for Virginia Beach's Community Legislative Package, held at the convention center. 8 City Council members were there: Will Sessoms, Jim Wood, John Uhrin, Barbara Henley, Harry Diezel, Rosemary Wilson, Bill DeSteph, and Rita Sweet Bellitto. From the General Assembly: Ron "Landslide" Villanueva, Jeff McWaters, Harry Blevins, Barry Knight, Chris Stolle, Frank Wagner, Ralph Northam, Yvonne Miller, and a Legislative Aide of Sal Iaquinto's. A number of City Staff were present. Some School Board members were there. What wasn't present were many members of the general public. I told a few coming in I was concerned about how many the 2nd District Congressional Debate was going to draw off. We got less than 20% of what the City had prepared for. However, the smaller group meant more substance, not to mention plenty of brownies and cookies for those who did show up. Military Affairs centered on JFCOM. Frank Wagner stated the Department of Defense would need a change in Federal law to abolish JFCOM. Also, the Navy has stated that not only will no new commands be recommended for Hampton Roads until we tackle our transportation problems, but they'll probably start drawing down current forces if we don't. Speaking of Transportation, the bad news is that there is no new news. Wagner spoke of potential revenue from ABC privatization and tolls on I-95 at the North Carolina border, but that's it. No one in the delegation anticipates new fees or taxes for transportation. Virginia Beach Vision presented it's five priority issues: intergovernmental relations, military affairs, local government investment, transportation, and government moving from defined benefit pensions to defined contribution pensions. The poll on the 2nd District Congressional race drew this blog's largest total of (117) votes ever. Kenny Golden got 46% of the vote, Scott Rigell 43%, and Glenn Nye 11%. At one time or another, each candidate had the lead. (Yes, Nye flew out of the gate.) Let's face it: Golden will be lucky to get half that 46% in November. The new poll is on Virginia Beach Taxpayers Alliance (VBTA) Vice Chairman/Chairman Of No Transportation Reid Greenmun. When he's declared legally insane, which conspiracy will he blame it on? He's well-known for outrageous statements, among them claiming Virginia Beach light rail would need 2,000 feeder buses (VBTA: Light Rail In Virginia Beach Would Require 2,000 Feeder Buses, 4/19/08) and that City Council could reduce the Budget by $530 million by fiat (VBTA Vice Chairman Calls For Cutting Budget By $530 Million, 10/8/09). The latest was Reid backing a 52 cent Property Tax rate for Virginia Beach. It's in the same VNS blog discussion as Wally Erb's Freudian slip on light rail (Clowndidate Watch 2010, 1st Edition, 8/13/10). When called on the crazy idea, Greenmun actually defended it. This might not be playing nice, but people need to start calling VBTAers (especially their leadership) on their outrageous statements. Let me point out the idea is so beyond the pale that none of their Council candidates are running on it. 52 cents would mean a 37 cent (39%) reduction in the rate, requiring $188.13 million in Budget cuts to offset. That's nearly four times the net cut John Moss ran for Mayor on in 2008. At least it's saner than $530 million. The four conspiracies have all been pushed by Reid, among Greenmun's other conspiracy theories. The poll closes on my birthday, so your vote is your birthday gift to me. All In Line For The 15! I took the above photo this afternoon at the Military Circle Transfer Center during the 4:45 P.M. lineup. In the foreground is the Outbound Route 15, Naval Station via Evelyn Butts and Wards Corner. You can see the long line to board that stretches off the photo to the left. First, this is on a Saturday afternoon. Saturday is the sixth slowest day of the week for bus ridership (Sunday is seventh), yet that is happening. A pleasant (in the short term) but problematic (in the medium term) trend during latter FY 2010 for Hampton Roads Transit (HRT) was that the big increases in ridership were happening on the weekend. Given that fewer buses run then, in subsequent years that will probably mean having to add more weekend service to handle the demand. The long term upside of this is that the trend means more people are abandoning their cars, helping relieve congestion on our region's roads. Second, for the "empty buses" crowd, just look at the above. The 15 was hardly going to leave empty. FYI, I just got a smart phone with camera and video capability this Summer. As I master it's functions, I hope to have more photos for this blog. For those of you who don't ride the bus, that should include more scenes like this to bring home the reality of what's going on out there. Most importantly, I am the only candidate in the 2010 Virginia Beach city council election that solemnly promises to advocate for and, abide with, a referendum for Light Rail in Virginia Beach. Further, in a leadership roll, I will defend Virginia Beach's genre to remain a suburban, vacation, and farming community rather than succumbing to urbanization and gentrification." Oooo, where do I start? 1. You want to elect someone to City Council who can't get "roll" (which Wally uses) and "role" (correct) right? 2. Even as he tries to distance himself from the extremist Virginia Beach Taxpayers Alliance (VBTA), which few people will buy, he admits Tidewater Libertarian Party (TLP) membership. The two are largely one group of people under two different shells. 3. Wally was a Republican who became a Libertarian, who pretended to be a Republican again. So he's back to being a Libertarian? Anyone want to commit to a candidate so prone to flip-flops? 4. Nice that Wally lets slip that he actually opposes light rail, rather than trying to pretend that he simply wants a referendum on it. 5. So Bill DeSteph and John Moss would still vote "No" on light rail even if we voted "Yes" in a referendum? Thanks for letting that one slip, Wally. 6. Uh...what elected official would endorse Wally for City Council? 1. Under Virginia Beach's current and previous Comprehensive Plans, the Strategic Growth Areas (SGAs) have already been zoned for urban redevelopment. Legally, we can't go back and downzone them. (Ask Loudoun County.) We passed the point of no return when the previous Comp Plan was adopted in December, 2003. When an opponent starts extolling "suburban living" when you bring up LRT, give them the old New England line that "You can't get there from here." We have no choice legally but to redevelop the SGAs. 2. By the TPO's projection, virtually the entire region's interstate network will be severely congested (Grades E or F) by 2030. Even that bleak forecast is based on all the projects in the 2030 Plan being in place by then, which isn't going to happen. When people tell you no one will ride light rail, let them know smart commuters will within a generation. 3. What few transportation dollars that are available at both the Federal and state levels are dedicated mass transit funds, not roads money. 4. The last two administrations in Richmond have been pushing Hampton Roads towards a multimodal transportation system, realizing our primary problem is our transportation model. Our region is 6th most dependent in the country on cars, which is unsustainable. 5. Building additional arterial roads would require bulldozing through subdivisions, which is neither cost-effective nor politically survivable. We can't depend on further asphalt alone, but rather have to reexamine our transportation model. 6. Housing costs and availability are putting a squeeze on blue collar families. Letting them become one car households aids their budgets and takes cars off the road for those who wish to or must drive. 7. We face Federal emissions sanctions. Emissions from light rail are where the electric is generated, not here in Hampton Roads. If nuclear-generated electricity, there are virtually no emissions. 8. Given that the money and power behind light rail is a mountain compared to the 31st Street mole hill, why do opponents delude themselves into believing they can stop it with an advisory referendum question? Even if they got it on the ballot, it would be overridden. 9. If we don't do light rail, what would the opponents propose to tackle the problems it's designed to? Until they have an alternative plan of specifics (not just hollow generalities), they shouldn't be taken seriously. Last night Governor Bob McDonnell held a Town Hall meeting at Old Dominion University (ODU) as part of his "Virginia Speaks" Tour. The large crowd nearly filled two rooms at the Webb Center. Governor McDonnell stated his Administration has focused on two things, jobs and opportunity as well as getting Virginia's fiscal house in order. There will be another Budget surplus announcement next week, while Virginia has gained 72,000 new jobs in the past 6 months. Cuts by Governors Kaine and McDonnell have reduced spending to 2006 levels. Questions and comments last night were on offshore drilling, abortion, parole administration, mass transit, mental health facility siting, etc. For those of you unable to attend, you may have two opportunities to hear what was said. First, WHRV-FM was recording the meeting not only for broadcast at Noon on Thursday, but to be put on their website. Second, blogger Vivian Paige brought her videotaping equipment. It's not on her blog yet, but she has a busy day job as a CPA. If only we can see that headline again in November. Toni Hedrick's suicide mission in Lynnhaven District is backed by only 6% of readers. That brings us to the 2nd Congressional District contest. As in the previous two polls, candidates are listed alphabetically. Have fun! Since this has been discussed out on the buses (on the Inbound 15 one night when I was on), I thought I'd get the word out that the facility can be utilized again. Yesterday's Virginian-Pravda brought us an article on Light Rail Now (LRN), the advocacy group that has been launched in Virginia Beach. http://hamptonroads.com/2010/08/va-beach-businesses-raise-cash-light-rail-now It's been awhile since I've used this blog to comment at length based on one of their stories, but I will this morning. A flawed assumption in the formation of LRN is that the group will only have to stand a couple years and can then fold, once the threat of the issue getting punted to refernedum has passed. I adamantly disagree on a couple levels. First is quite specific to light rail. Two years would probably get LRN to the decision to begin preliminary engineering on a Virginia Beach line, but a Final Funding Grant Agreement (FFGA) won't probably be until late 2014 or 2015. LRN needs to remain in tact until the Federal Transit Administration (FTA) has signed our FFGA! The Virginia Beach proposal could still potentially fall apart in that two-three year window if we're not vigilante. The second is more generally political. Not in my memory has Virginia Beach seen a political coalition as broad as this one put together. The personalities now brought together by LRN could be the basis of a political coalition to move Virginia Beach forward on many other issues, too. Given such, you want to keep them in the same room together as long as possible. In the Summer of 1914, the Royal Navy had been on maneuvers in the North Sea. When Winston Churchill received the news at the Admiralty that Archduke Franz Ferdinand (heir to the throne of Austria-Hungary) had been assassinated in Sarajevo, he gave the order for the fleet to not disperse. They held at Scapa Flow and were ready for combat when war broke out days later. In the same vein, LRN should not be dispersed. While the Virginia Beach Taxpayers Alliance (VBTA) is clinically dead and royally botched it's dance card for November's election, another regressive force could always come along in the wake of the VBTA. You want to have the forward-looking factions in Virginia Beach politics used to working together so they can do so well into the future. Virginia Beach's Resort Advisory Commission (RAC) held it's August meeting this afternoon. There was some good news. 1. Beach Street's website is at http://www.beachstreetusa.com There you can register for their newsletter that covers entertainment throughout Virginia Beach. This Tuesday the proposal to install overage parking meters to collect donations for the homeless goes to City Council. In a rarity, it will go to Informal (Council Briefing) and Formal (a vote?) on the same day. The Rudee Walk project will probably get underway in early 2011. On August 2 was the first garbage audit of our beach trash. About 50% was recyclable. Dwight Farmer, Executive Director of the Transportation Planning Organization (TPO), spoke to the Board of Directors of Light Rail Now on Monday. Most of his remarks touched on general transportation and roads, with only a small portion on light rail. However, his comments on funding should once again sound alarm bells. Transportation funding is usually measured in twenty year cycles. At the time of HB 3202 (which established the Hampton Roads Transportation Authority) it was at $13 billion for the region, with $8 billion raised by 3202's taxes and fees and $5 billion from other sources. It's currently only $2.5 billion. For those who attack rail, a "roads only" program would take in the neighborhood of $20 billion. First, when we're operating on less than 20% of what was anticipated at the time of the HRTA, only the fringe right can deny we have a severe problem. Second, for those who want "roads only! ", how are you going to fund an 800% increase in roads spending? You got to love the simple minds of members of the Virginia Beach Taxpayers Alliance (VBTA). For them, those in public life fit neatly into one of two boxes: those who parrot the VBTA line, or those who are corrupt "socialists". On Monday afternoon, having some time to kill between stops, I slipped into Virginia Beach's Meyera Oberndorf Central Library and got in some Internet time on one of their computers. I found that they have this blog filtered...but you can view Virginia News Source. The normal route for bringing a non-Catholic adult into The Roman Catholic Church in the U.S. is the program known as Rite of Christian Initiation for Adults (RCIA). It begins in the later half of the year, with the new Catholics brought into The Church at the Easter Vigil Mass. St. Gregory the Great Catholic Church (the largest parish in the Diocese of Richmond) will kickoff this year's RCIA with a Wine, Cheese, and Dessert Social on August 9 in the Tobias Room at St. Gregory's. It will run from 7-9 P.M. Anyone interested in becoming Catholic is welcome. In addition, any Catholics who never were Confirmed, had First Eucharist, or First Reconciliation are also welcome. I'm a convert who was brought into The Church at Easter Vigil, 1986. It's the smartest decision I made in my life. "It's too dependent on the overall economy for survival." Uh...Beth...what economic development investment isn't "dependent on the overall economy for survival"? Please, name three while you're at it. With "economic analysis" like that, no wonder the VBTA is hopelessly out-of-touch with reality!